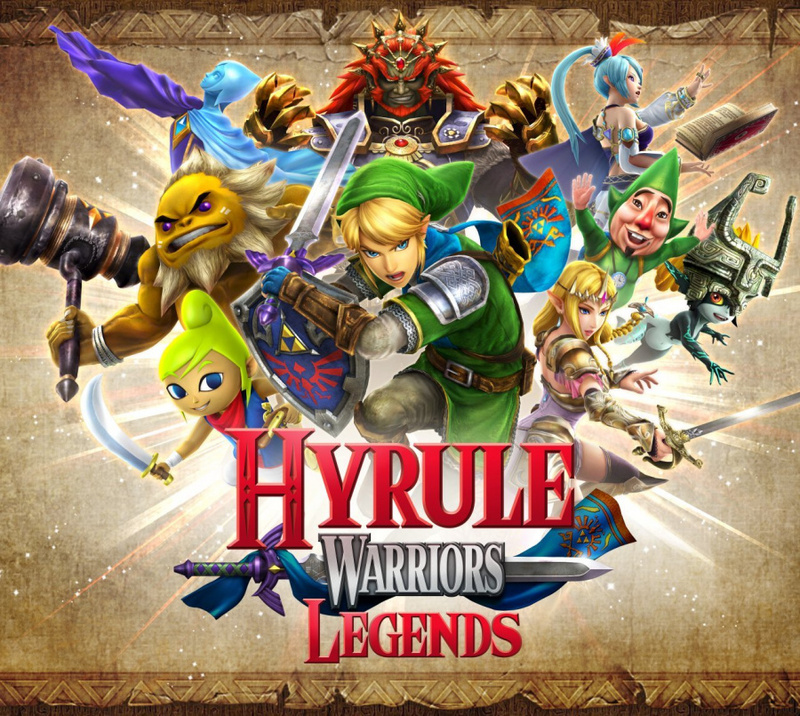 We're pretty keen to get our hands on Hyrule Warriors Legends, as the prospect of playing through the Wii U title with extra content and on the go is rather appealing. Yet it's a release that's concerning some, particularly those with older models; as it's a port of a Wii U title it's only fair to assume that it'd be better suited to the improved New 3DS hardware and it's faster innards. It seems that'll certainly be the case, too, as those with Japanese systems have been making comparisons courtesy of a demo of the title that's been released on the country's eShop. First off, well-known Nintendo writer and video maker Daan Koopman praised the game's performance on a New 3DS, but acknowledges a notable performance drop on an original model. Video evidence is certainly clear, too. Below is a Koei Tecmo video we previously shared which shows it running relatively nicely on a New 3DS. Below that is a comparison video by GameXplain that shows the same area of gameplay; more interesting for our money than the Wii U comparison is the framerate, which is confirmed to be from an original 3DS and is well below that seen on a New model. It's a noticeable difference, and at those levels it looks like those playing with a 2DS, 3DS or 3DS XL should think very carefully before taking the plunge. It also raises the question, based on this footage and these impressions, of whether this should have been a New 3DS exclusive. Let us know what you think, and whether you're concerned about the performance on older models. Seems like a game that could've done with being a New 3DS exclusive. Wow, they really shouldn't be releasing that for regular models. It wouldn't surprise me if it was planned as new 3DS exclusive but once they saw it wasn't selling like the Lite model of the DS did, it might not make financial sense to release games as new model exclusives. Well I don't have a New 3DS so... there goes my hype for this game. I'm glad I have a New 3DS... though I'm still unsure if I'll be getting the game. It being on 3DS is more appealing to me, but I already have it on Wii U. If existing owners were offered a discount, that'd be nice. not ideal but it still looks perfectly playable to me. once again im not paying $200 for a new system that has 2 exclusive games and one with better frame rate. I don't think it was worth it to NOT make it new 3ds exclusive. Along with the amount of people who say they wont pick it up just because of the lower graphics, I don't think anyone with an original 3ds will want to play this game at sub 15 fps with no option for 3d either. Well New 3DS corresponds to the DSi, so I think they're making comparisons to the DSi's sales. Well it's likely most people who'll be buying the game for use on an original 3DS won't know about this and thus won't think of it as a problem. Also it doesn't make much sense financially I guess for them to release it on New 3DS only, when comparing the install bases, really. These are all companies after all. Definitely, either that or make it specifically to run smoothly on the regular 3DS. If nothing else, they could have released a New 3DS-centric patch to take advantage of the hardware (or do what they did with the DSi or N64 and have it made for the regular 3DS but take advantage of the extra hardware power of the New 3DS if you've got it. That or most likely they didn't want a backlash especially in the West if they made it a New 3DS exclusive. New 3DS has done better than analyst projections, but not as good as other projections. I might buy this game if I can get it at discount somewhere. Honestly, with performance this below-par, they should have just made it a New 3DS exclusive and had done with it. It would have annoyed a fair few people, but it may have been better to do that than release something very below standard. With my original 3DS, I wasn't planning on getting the game the game anyway, and now I'm glad I made that choice. Definitely see a difference, although the regular 3DS version is still certainly playable, unless you're obsessive about framerate, in which case you probably already bought the new 3DS anyways for the extra oomph, most likely - or you will buy it for this game - and isn't that really what Nintendo wants? Still looks very playable on 3DS. Be honest - if you couldn't see the two side-by-side, would you notice? After watching just the old 3DS video for a while, I got used to the framerate. If I was a 3DS owner, I would still be very excited for this game, and I'd be very disappointed if this was a New 3DS-exclusive like Xenoblade. I'm impressed that this game runs on any of the 3DS hardware. @A01 And miss all the sales of being buying a N3DS to run it better? That'd be crazy. This is what the PC market does. I understand that the 3DS is aging hardware that was never really cutting-edge in the first place, so I never complain about the occasional pop in or jagged edges but HWL just looks plain terrible running on the old model. I have a New 3DS and loved the original game so I'm buying, but absolutely no way would I be purchasing this for play on an original model. They will get more sales because of this not being a New 3DS exclusive, obviously, but at what cost? Putting that product out there at full price for original 3DS owners is a joke. @Peach64 While I doubt that is the reason. It's very unlike Nintendo to release a game that preforms as half-assed as this. People wanted reasons to own a new 3DS (like MH4U isn't enough?!). Here's a new reason. Glad I have my new 3DS MH4U special edition. @CB85 This is hardly a new game though. @justastone Neither was Xenoblade but that was made into an N3ds exclusive because some games can't be shrunk easily. I do feel that if the framerate is significantly bad then they should make it an exclusive to console and N3ds. I was actually surprised this wasn't a New 3DS exclusive game. After E3, I predicted that they would announce that it was New 3DS only. However, I bet the New 3DS hasn't sold enough to justify it. Code Name: Steam is another game that runs a lot better on the NN3DS, at least so I'm told. I have a 3DS, so the new handheld pays off. AHHM SOOOOOO EEEEEXXXXCIIIITTTTEEDDDDDDD for this game n my NEW 3ds! @XCWarrior Thing is, Xenoblade is the only reason to pick up a New Nintendo 3DS and that's because it is exclusive to the new hardware. I know games like Monster Hunter 4 and Smash Bros play better on the new model compared to my 2DS, but as long as these games remain playable, I don't see any reason to upgrade. Hyrule Warriors would be tempting were it not for the Wii U version. Seems nearly every game that releases now runs better on New 3DS. As if it wasn't worth it already just for the faster downloads and stable 3D (and C-Stick so you don't have to tote that gargantuan CPP around), consistently superior performance seals the deal. But at least original 3DS owners can still play the game, right? Better than nothing. Still, I'd look into upgrading if I didn't have a New 3DS by now. Too many games that are inferior on older models. Well judging from that video it is definitely a good thing I own a new 3DS or else I would be very disappointed though this should be expected since the original model always seemed like it wouldn't be able to handle a port of the Wii U game in the first place. So new 3DS players will get the game with a decent frame-rate and be able to play the game in 3D. 2DS & 3DS owners will have a bad frame-rate and will have to play the game in 2D (as previously stated weeks ago). With this in mind, I don't see any point the game being release for anything, other that new 3DS'. Of course its business, and a lot of gamers are likely to buy this game, most properly on older 3DS' and 2DS', and most will be disappointed with it. The CPP functions as a nice grip for the normal sized OG model; I actually use it as just that for non-actiony games that don't even need it. And the 3DS's biggest game this quarter- Fire Emblem Fates -doesn't have any form of enhancements whatsoever on the Nu3DS, while still looking noticeably better than Awakening. Put 200 hours into MH4U on an OG 3DS using a Circle Pad Pro; was fine with it. Heck, Cross actually runs better than 4U because they locked the framerate at 30 (while it's normally struggling at 60) and brought over the Nu3DS textures to all versions; the Nu3DS gets a better shader/more dynamic lighting instead. @Ryu_Niiyama I have Fallout 4 on the Xbox One and I have yet to see any issues. Granted, I don't have a PS4 and copy of Fallout 4 for that system to compare laying around, but Fallout 4 is playable on the Xbox One. I think people put too much stock into framerates when it comes to games. Of course, 60 FPS should always be a target, but many major games run at 30 FPS and are perfectly playable. And just like the difference between resolution between the PS4 and Xbox One, I doubt many people honestly care at the end of the day. Granted, a blade of grass or other texture might look better on one system then the other, how many people are going to notice? @Peach64 remember a few months back when I was telling all the extras wouldn't be a big deal because the downgrade would be to huge. I also pointed out performance issues. @Caryslan I've sat my OG 3DS and new 3DS XL beside each other and loaded up the same thing from the power off position. The difference is unreal. Miiverse is basically unusable on the OG (is it even on it). The eshop loads faster as well. I have a hard time going back to my OG when I'm just cleaning out streetpasses trying to finish up puzzles. n3dS is so much nicer of a system, people clearly don't realize it based on the lack of a real sales bump from it. MH3U didn't allow Miiverse pics, and I sunk 600 hours into that game. So when MH4U released, I was very interested in posting pictures to Miiverse (which was only possible on New 3DS). And with 400 hours in that game I got a lot of good ones- it was also just nice picking up and playing with no strings attached. But ya, the CPP is actually comfortable, and if you don't have a new 3DS you can manage. But I think most people, once they've experienced the luxuries of the New 3DS, won't want to go back to playing on original models. Some games (like Fates) will see no difference but many others (Majoras Mask, MH4U, Smash, Xenoblade, Hyrule Warriors, Binding of Isaac, etc) do, and that's beyond the standard benefits of faster downloads, stable 3D, etc. Ofcourse the game looks faster and smoother on the New 3DS than the original, therefore I'm happy to have the new one. But still I think it looks playable on the older ones. You get what you pay for so to speak. Excellent. I was hoping this would have enhanced performance on the New 3DS. Although, unlike MH4U, this barely even looks playable on the older model. Definitely picking this up, then. Should have been a New 3DS exclusive from the start, but I'll take better performance. @Ralizah 100% agree with you, it could be a wake up call to people that more games like this might be coming. unless a new system is announced later this year, that being the nx, but other Nintendo news says there keeping the 3ds for awhile i remember reading that. I'll be sticking with DLC for the Wii U version since I don't have a New 3DS. @abbyhitter i don't think they announced the Linkle/wind waker things as dlc. you can transfer them to the wii u game and use them, but not the extra story. likely the switching characters in the 3ds game might the reason it might not happen tbh. it might make some levels unplayable without that feature, we will have to wait and see. i'm hyped for it, i have a new 3ds already worth the upgrade for the quicker dl time for me alone imo. I really would rather just stick to the Wii U version. I'd rather get the extra stuff as DLC. Edit: I have a N3DSXL. However, one uncompletable Hyrule Warriors is enough. Seriously, trying to get ranks on Adventure Mode burned me out months ago. I'm literally waiting for a couch coop buddy on the right day to revisit the darn game. @kenrulei To be honest, the revealing of news for this port has been quite a mess. You would have expected much more concrete details by now as the game comes out in 3 days in Japan (considering time zones, it's already Tuesday in Japan). This is why I've been predicting a Direct for sometime in January before 22nd January and that is potentially still possible as it could be on Wednesday or Thursday. Failing that, we'll get all our needed info via the GameXplain stream on Friday. I'm one of those in the camp that shrugged my shoulders at the reveal of the New 3DS, thinking I didn't need it. I probably still don't, but that being said, I couldn't go back to the slower loading times (especially on Smash) of the original models and have gotten used to how the 3D - at least to me - looks so much better and more smooth, giving my older games that I never played in 3D new life. Do I think its a necessity? No. Is it worth another $200? Not really. But it is certainly nice to have for cases like this article demonstrates. I wouldn't say that this should've been a New 3DS exclusive, as people would've probably complained more, not knowing that the game would run this bad on their older models. It may be slower than Metal Gear Solid: Snake Eater 3D, but it's harmless. And who knows? The lack of 3D, the probable inability to use Miiverse or Internet Browser, fewer enemies on-screen, bad draw distance, and of course terrible frame rate might be the extra push to help those who were on the fence about upgrading to a New 3DS. People like that wouldn't be doing it for one game, and would likely have other games that would benefit from having the newer system. In other words, Nintendo makes more profit by making the game available for all systems in the 3DS family. The New 3DS game footage looked great, but the video itself started being slow and buffering when I watched the Old 3DS version. Very fitting. Now I still need to decide whether to get the Wii U version, the New 3DS version with my beloved Wind Waker characters, or neither. I played the demo on an o3ds and it was perfectly playable! I didn't notice any lag or frame drops, but it might be just me! Of course it will run better on the n3ds (and have 3D), but unless you try both, or directly compare them, you probably won't notice! Does anyone realise that the comparison video is between the Wii U version, and the 3DS? t be cancelling my pre-order. Still looks like it will be grea fun on my regular XL. @Joshua_Hylian Other videos show the differences between the 3DS versions. It's still pretty drastic. Tbqh if I didn't own a N3DS I don't think I would've gotten this game, as I already own the Wii U version. That being said, I have a N3DS so bring it on! "The Legend of lag", really? the speed seems fine and enjoyable. My only concern is the seemingly lack of ennemies on the regular 3DS in comparison to the new3DS. I was expecting a lesser number of simultaneous ennemiez on the portable game, but why does it seem like the same game has more targets on the new than on the normal one? PS: sorry for the copy/paste from FB. @XCWarrior OG 3DS plays all games that I've interest in, yeah, it is slower and has some unstable things but it does its job, I'm not gonna spend some of my savings for some stability and faster loading times when I can play everything on an OG model (except for Xenoblade and Isaac, even then I have a laptop and a Wii, so I can play those two on those systems). Stability and faster loading times isn't enough for Nintendo to have my money, they need to do better to convince me to upgrade. @Rei Are you really surprised? The 3DS has 3x the processing power of the original 3DS and thus can handle a lot more enemies on screen at once. Frame rate aside, this game looks very washed out with little detail. I think I am going to need a demo before buying it. I have a New 3DS but so far the upgrade hasn't been worth it. I think I'll skip this (since I only have a regular 3ds) and just wait for the Wii U version (or dlc if it comes out as dlc). It honestly doesn't seem like that big a deal to me. Well, if I do get this, I think it'll be for the Wii U. There is no way they would make this New3DS exclusive because the reason it's going handheld in the first place is to get double or triple the sales with minimal effort. Plenty of people will buy this for the old 3DS and be perfectly content with it, plenty. I wish I'd seen this before preordering the limited edition, but I guess there's always my friend's New 3DS to play this on. @Caryslan Well I think you are half right (or rather I agree with half of what you said). Just like graphics some people jump on the elitist train and start complain about stuff they can't actually discern. I have actual vision issues on top of playing games within which frame rate matters (fighting games and music games) and I can tell the difference personally. If it dips below 45 from 60 for longer than 3 or so secs I start getting a headache. I hate getting a new tv for that reason. As for fallout I'm only going by what I've heard from others as I'm playing on PC with a mostly steady framerate. At the same time Bethesda games run the gamut even on identical hardware. An area that is totally free of bugs for one..may not look the same for others. Even on the same hardware even. I have skyrim saves where guards walk in the air when they die while other saves work just fine...i have no explanation since im using the same mods and it happens even when i turn the mods off. Not necessarily a deal breaker for me (since I don't have a new 3ds). Looks totally playable to me. Still on the fence as to whether I want this or not. Will have to try a demo. It is the dream of every game maker. The game can look awesome in every press footage and commercial thanks to the n3ds, yet most people will not necessarily see the same on their systems. I own the 3DS and New 3DS. I own the WIIU version. Did some of you people actually think that the 3DS version would be on par with the WIIU version? Your comparing apples an oranges. This game can easily give you 200 hrs of game play and I'm still not done getting everything. The regular 3DS can play it. So what if it lags. This is a pretty good game. Some what repetitive, but very good. If you never got it. I would totally get it. I might get it for my N3DS just because its that good. I'm still waiting to see what the extra content will offer. This game looks so lacking on 3DS I don't even... And even if they port Toon Link and friends to Wii U version, what's the point without adding some new adventure maps and such with it? The game's replayability isn't that great. But maybe that's just me. I'm happy to see games that take advantage of the N3DS's extra power. That's kind of what I expected to get when I spent my money on the thing. And if it's still playable on OG 3DS, great! I dont see a problem with the framerate. The way you guys made it sound like it was like that hacker video where they underclocked xenoblade chronicles to run at regular 3DS speeds. This looks perfectly fine for my current 3DSXL which I refuse to trade because I love red and black and the N3DS colors are.... Blah. That being said these are off youtube so I'll wait for a demo to play for myself before dropping $39.99 on a new copy. @TeeJay Not surprised about the hardware power difference, but about the fact this one difference makes the game different to play based on your model of 3DS. Also surprised that I am the only one pointing that out, while everyone talks about the "horrible" lack of images per second etc... Particularly since I don't notice any thing about it that would change the game accordingly to the 3DS version. @Ryu_Niiyama hey! I don't know what your vision issues are but I have a lot myself. I have difficulty tracking fast games unless they are literally on a screen as big as I am. I only have a 3DS...I have the New XL because my old one broke. I find on handheld etc...the faster framerates are hard for my eyes to track. I can keep up with RPGs and things like that. BUT...the old system's rate drops on this game are totally unacceptable to me. I don't care about super sharp textures as long as I can recognize items and characters...but I do care about the way the game runs. The render on the old system is too short for me to strategize, and the rate drops are too jarring...akin to stopping short and falling on one's face. @ReineDeLaSeine14 Yeah for those that can ignore frame rate...more power to them. I have no such luck. I have to spend a ton of time calibrating my tv when I play music games (but I love taiko drum master too much to stop) As for me I'm a ocular amputee after a childhood accident and I have a hereditary degeneration of my retina in the remaining eye and just found out I'm at risk for early onset glaucoma... woohoo. Ah well I'll enjoy it while I can and hope for the best. Since I don't have an older model, I don't have any concerns. If there are issues then owners should wait for the NL review, I'm sure the reviewer will not on sit on the fence, and say 'avoid' if there are issues. This game, Smash Bros and Xenoblade are just three recent games that really should not be squeezed into a 3ds. They are big screen games. Nintendo's time could be better spent making games for the 3ds. Well what did you expect? Original 3DS is five years old at this point and that game has a lot enemies on the screen at once.